KAMPALA, Uganda (eTN) - Routes Africa opened yesterday at the lakeside resort and conference complex of Munyonyo with new record attendance recorded by the organizers. This 8th edition of Routes Africa has brought a large number of airline executives, airport managers, aircraft manufacturer teams, government representatives from transport and tourism ministries across the continent, tourism boards and related service providers to Kampala. Topics for the three-day meeting will cover all aspects of nurturing and developing air traffic across Africa, with dedicated sessions discussing Private Partnerships for Airport Management and Development, New Carriers for Africa � the Rise of LCC�s, Driving Tourism in Africa � a panel moderated by this correspondent � and last but not least The Outlook for the Future. A series of pre-arranged B2B meetings, in small groups, as well as one on one, have also taken place on day one of the Routes Africa meeting, with more to come before the end of the conference on Tuesday, allowing airports to meet with airlines and airlines to discuss potential cooperation on new routes and ATR. Strategic summit sponsors - Embraer and Bombardier, are showcasing and discussing their latest innovations with airline partners. Routes Africa co-hosts - Uganda Civil Aviation Authority and Entebbe International Airport, had the opportunity to meet Africa�s "who is who" from the aviation industry, while quasi national airline Air Uganda used the summit to launch their latest destination Mogadishu on early Monday morning with the inaugural flight. A large number of delegates took advantage of complimentary tours on Saturday, courtesy of the hosts and the Uganda Tourism Board, to visit either the Source of the River Nile in Jinja or the Ngamba Island chimpanzee refuge, while others took advantage of the splendid weather over the weekend to relax on the shores of Lake Victoria or see the colourful markets in the city of Kampala. Muguette Goufrani of Africa Travel Magazine gave her impressions:"So many highlights marked our month in Uganda, one hardly knows where to begin. Our flight via American Airlines and SN Brussels says a lot for their new alliance, which allows access to Africa from over 30 U.S. locations. We boarded in Vancouver on Canada's Pacific Coast and had one of the most perfect, seamless trips ever, even though we touched down in Dallas and Chicago en route to Brussels. 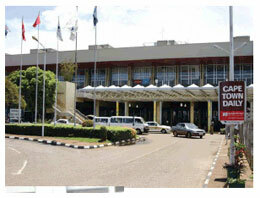 U.S. customs was cleared in Vancouver, and our luggage was checked through all the way to Entebbe, a further convenience."